All the gardening television programs and magazines tell you that you should mulch your plants. It helps suppress the weeds and retain moisture, so that has to be a good thing. When you mulch, there is much less work to do maintaining your garden. For those of us who have dogs to spend our time with, that has to be good news. Mulches can also improve the texture of your soil. 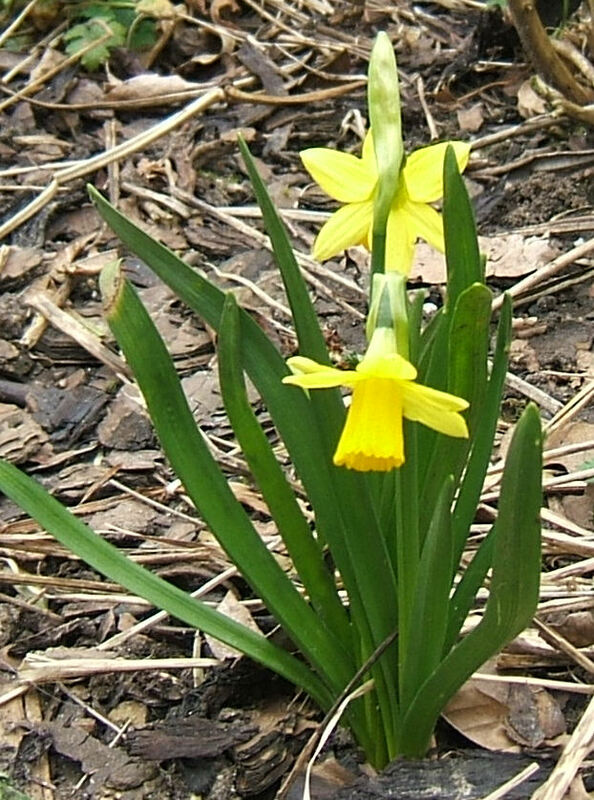 Over time, they are taken down into the soil by worms and winter frosts and become part of your earth. The best mulch to improve your soil will depend on your soil type. Organic mulches will improve the texture of virtually any soil. Gravels can be very useful in clay soils, to help break up the close knit clay particles. Don’t expect improvements to your soil to happen rapidly, it can take many years to improve a poor soil, particularly if you expect mulches to do all the work and don’t do much digging. An added benefit is that when mulch is applied, the impact of dogs’ feet crossing the soil (and yours, when you venture into the beds to retrieve anything they may have left there) is much reduced as the mulch, particularly if it has big particles, spreads the load, reducing the compaction of the soil and your garden will look a lot better (where you can see the soil and it isn’t covered with plants). Garden centres stock a wide range of mulches in what appear to be big bags, but I can assure you that when applying mulch at least 2 inches deep, that disappears very quickly as you spread it on the soil. Much more cost-effective is to buy in bulk, certainly initially. I tend to do a bulk buy every couple of years and then use the bags in the intervening years of areas that look like they are a little bare. Be aware, some mulches are “enriched” with manure of some form. This tends to be very interesting to dogs, and they will frequently have great fun “exploring” these mulches for the “interesting” smells, so you will probably want to avoid these. The problem usually only lasts until there has been some rain though, so if you cannot find a mulch that is not “enriched”, you may want to heavily water the mulch. Whilst not being a mulch, many people use pelleted chicken manure and other organic fertilisers on their soil. 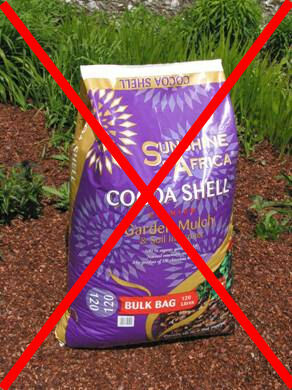 These have the same issues as “enriched” mulches, so if you wish to use them, you will probably want to consider putting them under a mulch to avoid over-enthusiastic investigation from your dogs. So, what mulch should you use? There are a wide range of alternatives. Gravel is very popular. It is long lasting and provides a foil for the plants. 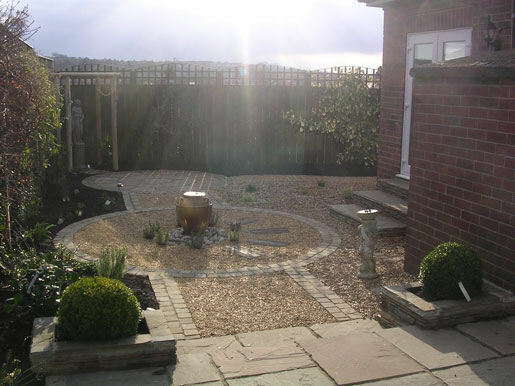 Gravel gardening has become very popular as it provides an open area with planting interspersed across it. Gravel gardens work well with Mediterranean plants which have become very popular over the last few years sue to climate change. Typically a membrane will be placed on the soil to stop weeds and then planting holes are created in the membrane. Once planted, the membrane surface is covered in gravel to provide a more pleasant surface. A wide range of gravels are available in various size particles and colours. I personally don’t believe that gravels gardens are good with dogs. The plants are just far too vulnerable to canine paws with wide spaces between them. There is just no reason for the dogs to learn to respect the plants. There is also the fact that it can’t be too nice for them to walk on and the likely hood of it being spread around the garden and maybe house on their paws. I have only ever had a small patch of a gravel garden and decided to completely get rid of it when the garden was re-designed. Wood or Bark mulches have the bulk of the market and come in a number of different size particles. Manufacturers tend to have their own terms for the different sizes. Typically the price will go up as the particle size increases. The smaller the particle size, the quicker it will disappear into your soil. To be sure of the particle size I am buying, I have been known to open a corner of a bag. I like a nice large pieces of bark at least 1 inch across, bits that actually look like wood rather than chips or sawdust. Once the bark is down, you may notice places where it has moved off the bed and onto the paths or grass. If you are like me, your initial reaction will be to blame the dogs for this happening. However, if you watch carefully, particularly in the mornings, you will see that the culprits are actually the birds searching around for some nice juicy worms. Compost is the best soil conditioner. It is free if you make it yourself from your garden waste. Many councils are now selling compost made from the green waste that they collect. However, as the particle size is very small, it will do little stop your soil becoming compacted by canine and human traffic. Shredded Tyres are now being sold as a mulch in some parts of the world. I know we have to find good uses for old tyres, but in my opinion a mulch just isn’t one of them. However I have heard of them being used under grass to reduce the compaction in areas of very heavy use such as public gardens and I can see some sense in that. Cocoa Shells should be avoided by gardeners with dogs. I know that they release a lovely smell of cocoa when it rains, but cocoa shells (like chocolate) can be toxic to dogs. Obviously the effect will be dependant on the amount of shell eaten. The shells have about one tenth the amount of theobromine that is found in unprocessed beans. Eating cocoa mulch has four possible outcomes. The most common is vomiting, in 50% of cases. Next most common, in 33% of cases, is tremors (shaking). And 17% end up with tachycardia (rapid heart rate), hyperactivity or diarrhea. The fourth outcome is no effect on the dogs health at all, and this is the result in 33% of cases. These %s add up to more than 100% as some dogs will suffer more than one symptom. It just doesn’t seem worth the risk of using them. Sea Shells can be used much like gravel. It is particularly useful for high profile small areas where you want to make a statement. The majority of mulches not only improve your soil and reduce the amount of weeding you have to do. The key thing for a dog owning gardener is to take their canine friends into account when making their choice.